Great Outdoors (GO) was started in 1977 by Greg and Paul (pictured here). Among many discussions, they wondered if it would be possible to offer an alternative place where Gay, Lesbian, Bi-sexual and Transgender people could meet and socialize outside of the bars. Paul, a catholic priest, suggested that it would be interesting to introduce the gay world to the phenomena of camping, hiking, getting dirty. Paul took Greg for a drive up the Big Sur coast. Greg fell in love with Big Sur and Great Outdoors was born. In 1981, organizational By-Laws were adopted allowing a new group of people to assume the leadership of Great Outdoors. Greg and Paul could step back. There have been chapters as far away as San Francisco and Phoenix. Today five chapters continue the work started over forty years ago by two men trying to make a difference in their community. Greg and Paul still have great affection for Great Outdoors and are happy that it continues to promote the fundamental values which they instilled into it. Here's too many more years of outdoor fun. This history was submitted by Father Paul Breton from San Bernardino. The photo above is of Paul - taken in 2008 at our 30th anniversary campout and conference. The first annual conference (1981) was held in Palm Springs to establish the By-Laws. To read the article - click here. In 2014, after 40+ years with our original logo, we adopted a new Corporate logo. It was developed and first appeared on t-shirts in the 2012 Palm Springs Pride Parade. 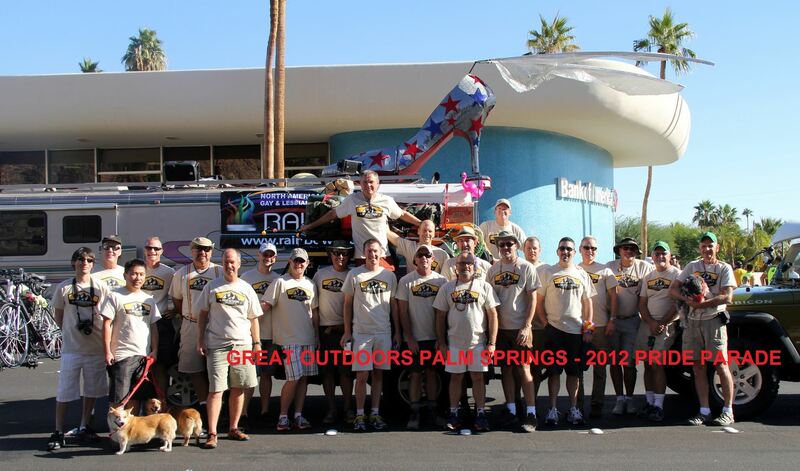 It appeared again in the 2013 Palm Springs Pride Parade by our Los Angeles Chapter. The new logo features a mountain scene, followed by the letters "GREAT OUTDOORS" below and a website URL.